Finally Fit: Articles - Supplements Again! 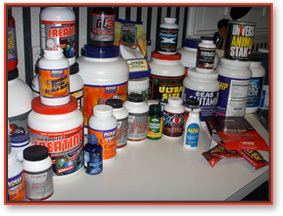 One of the most popular and recurring questions seems to be "Where can I find my supplements at the best price?" and/or "What supplements should I be taking to magically transform my physique?" Once again, and especially for those new to the "Iron Game", while some supplements are a convenience and a "bridge" of sorts to complement an incomplete dietary approach, by no means are they the most important piece of the puzzle. Proper training will first and foremost, provide the potential stimulus for growth and change, supported by macro and micro-nutrients found in FOOD, along with proper rest. Consider this gang; Take any and all the supplements you can (or can't ) afford. Disregard a sound and proper training application (or even make it a minor consideration). Don't worry about sleep requirements. Now we will all sit around and wait for your "amazing transformation" to occur. Seems as though that's what the majority of supplement manufacturers would have you believe. Before you decide to spend your hard-earned dollars on "success in a bottle", take a deep breath and critically analyze what you just read. Porter Freeman, for example, is the only Body-for-Life Challenge Champion in history to have lost 54 lbs. of fat and also gain 9 lbs. of lean mass in 84 days. His supplement approach--1 multi-vitamin daily, along with a serving of Betagen and Cytovol. That's it. Period. Lynn Oglesby, 2002 BFL Official 1st Runner-Up (women 40-49) used either a Myoplex Lite OR a Simply Protein shake as her daily supplement choices. Body-for--LIFE Lifetime Achievement Award winner Ann Cortes lost 93 lbs. in 2 consecutive BFL Challenges---Precision Protein and Flaxseed oil were her 2 supplements. I can go on and on. I am not being hyper-critical of proper supplement implementation. Just trying to open some eyes as to what is really most important to affect change. Proper exercise movement selection, execution, regulating the volume and frequency of the workouts, genetic predisposition, etc.,-- Well, you get the point. MRP'S (Meal Replacement Powders), Whey constituate and/or caseinate protein powders are wonderful (and most convenient ) for example, but will do nothing to offset the lack of a proper training stimulus. The ideal approach is to train properly, recover properly ( food, sleep,and tranquility ) and supplement wisely.